STOP PINCHAZOS sealant is able to repair up to 95% of punctures. 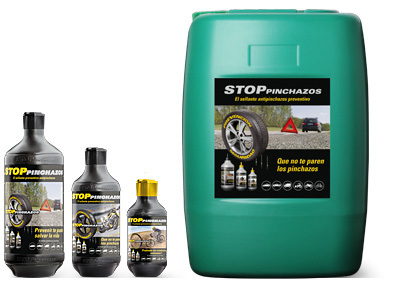 STOP PINCHAZOS is a product suitable for all types of vehicles such as bicycles, motorcycles, cars, buses, trailers, industrial machinery, ambulances, etc..
STOP PINCHAZOS can be used in any type of tires, with tube or tubeless. STOP PINCHAZOS repairs air leaks up to 6.8 mm in diameter in any type of tire. It also seals and eliminates the slow loss of air between the seat or tire bead and rim and the board of the inflation valve. STOP PINCHAZOS will not repair a tire puncture in potentially dangerous structural damage, such as cuts in the tread, but it will improve safety when such accidents happen, and thanks to his performance will allow a more controlled air leakage, minimizing effects of a blowout. STOP PINCHAZOS eliminates underinflated tire and losses and slow air leaks. Increases the tire life up to 20% and reduces the cost of fuel, reducing CO2 emissions. Will not harm or affect the tire to the rim. Preventive and remedial fluid that automatically seals punctures up to 6.8 mm over 50 times during the life of the tire. You can reduce the effects of a blowout. Works well in environments from -20 º C to 90 º C, non-toxic, non flammable (not ADR) and is not volatile. Compatible with tires inflated with nitrogen. How does STOP PINCHAZOS works? For what kind of tires?